Localization means determination of the site or place of any process or lesion. The radiographic image is a 2D representation of a 3D object, but for clinical practice it is necessary to derive 3D information. The standard periapical radiograph shows teeth, bone, foreign objects or impacted teeth only in 2D, namely, in superoinferior and anteroposterior relationships. A mediolateral relationship of the objects is not seen. We performed this study because the maxillary canine has a high incidence of impaction [Table 1] and its position is of clinical significance, as it is regarded as the corner stone of the dental arch, and its role in occlusion during mandibular lateral excursion is equally well known. The purpose of this study was to determine and prove that localization is achievable with a single panoramic radiograph. 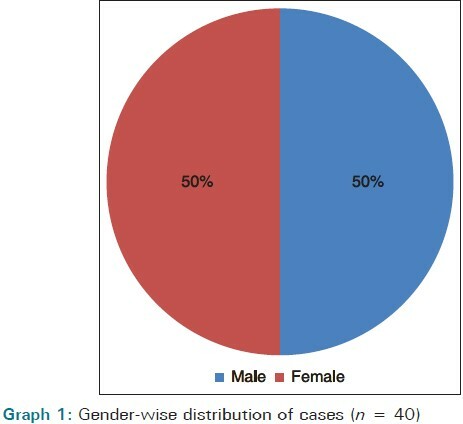 The study group consisted of 40 patients between the age group of 11 and 52 years, of both the genders, with clinically missing and malposed canines; excluding bilaterally impacted canines, rotated contralateral erupted permanent canines, primary dentition, and any arch discrepancies. These subjects reported to the Department of Oral Medicine and Radiology, Seema Dental College and Hospital, Rishikesh, Uttarakhand. The patients were clinically examined and checked for any retained deciduous, missing, or erupted malposed maxillary canines, after obtaining an informed consent. Radiographic assessment has been done by using radiovisiography (RVG) (Make: Sopro) for the buccal object rule and panoramic radiography (Make: Kodak 8000C Panoramic and Cephalometric Unit). As the buccal object rule states that the buccally located object moves in the direction of the x-ray beam, on changing the direction of x-ray beam, the position of the impacted canine can be determined. In this study, to assess the shift of the impacted canine, the incisal tip of the canine has been checked in each radiograph. For panoramic standardization, to ensure that the horizontal magnification is equivalent, the widest mesiodistal dimensions of the mandibular first molars on both sides have been measured using the Kodak dental software and a digital vernier caliper, and compared. If the difference has been found to be greater than 5%, the radiograph was excluded from the study. A basic principle of panoramic localization is that an object placed closer to the film (i.e., farther from x-ray source) throws a smaller shadow than an object located at a greater distance from the film and closer to the x-ray source. Therefore, the objects placed buccally in the patient's mouth appear small in the horizontal plane, as compared to the objects placed palatally. The widest mesiodistal measurements were made (using the Kodak dental software and a digital vernier calliper) of the displaced tooth on a line perpendicular to its long axis and of the contralateral canine on a line perpendicular to its long axis [Figure 1] and [Figure 2]. The measurements were subjected to statistical analysis. On comparing the buccal object rule and panoramic localization techniques in these patients, it was found that two patients showed labial positioning according to both the techniques, 17 showed palatal positioning according to both techniques; and in one patient, the position of the impacted maxillary canine was found to be palatal according to panoramic localization, but in the same plane, according to the buccal object rule. According to buccal object rule, the position of the impacted maxillary canine was found to be labial in 10% of the cases, palatal in 85%, and in the same plane in 5%; and according to the panoramic localization technique it was found to be labial in 10% of the cases, palatal in 90%, and in the same plane in 0% of the cases. The weighted Kappa value (0.63) for comparison of the buccal object rule and panoramic localization technique showed moderate agreement, with a standard error of 0.286, and 95% confidence interval (CI), ranging from 0.0682 to 1.000 [Table 5]. On comparing the clinical and visual method and the panoramic localization technique in these patients, it was found that 12 patients showed labial positioning according to both techniques, five showed palatal positioning according to both techniques, and in one patient, the position of the malposed maxillary canine was found to be labial according to the visual method, but in the same plane according to the panoramic localization. In two patients, the panoramic localization technique showed palatal positioning, but when viewed clinically the malposed canine was present labially. According to the visual method, the position of the impacted maxillary canine was found to be labial in 75% of the cases, palatal in 25%, and in the same plane in 0%; and according to the panoramic localization technique it was found to be labial in 60% of the cases, palatal in 35%, and in the same plane in 5% of the cases. The weighted Kappa value (0.684) for comparison of the visual method and panoramic localization technique showed good agreement, with a standard error of 0.154 and 95% CI ranging from 0.382 to 0.986 [Table 6]. Reliability between the buccal object rule and panoramic localization technique was calculated by using the correlation coefficient, which was seen to be 0.7127, with a 95% CI of 0.5157 to 0.8381. There was a statistically significant correlation between the localization techniques with P < 0.0001 [Table 7]. On account of the denser palatal bone and thicker palatal mucosa, as well as a more horizontal position, palatally displaced cuspids rarely erupted. 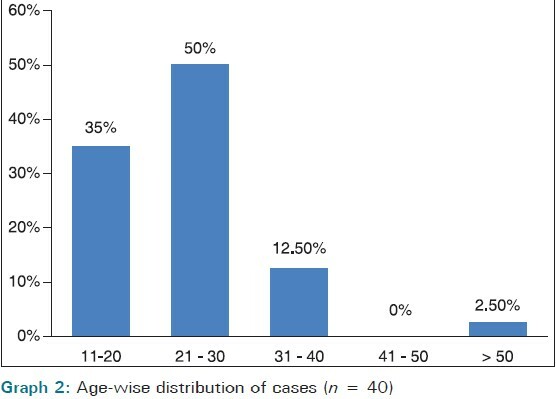 In our study, 55% of the maxillary canines were found to be placed palatally. The result was consistent with the study conducted by Nordenram and Stromberg. 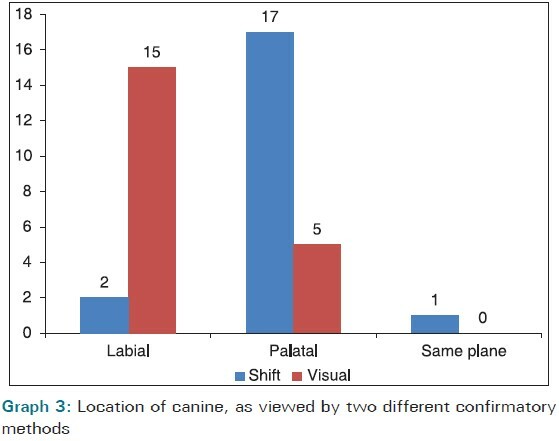 , Fournier et al., and Gaulis and Joho  reported 75 and 66% palatally placed canines, respectively. If labially impacted cuspids erupted they did so vertically, buccally, and higher in the alveolus. In this study, 45% of maxillary canines were found to be placed labially. Methods used for object localization include, the parallax method and the right-angle technique. Radiation exposure with these techniques is much higher, as two or more radiographs are required. Multiple exposures for localization of objects should be avoided as complex damage to the DNA, the basis for cancer formation, may occur with x-rays. A panoramic radiograph is a screening radiograph that is routinely advised in dental practice, as it provides information about the entire dentition in one radiograph. Various studies have been conducted to evaluate the reliability of the panoramic radiograph in localization of the maxillary impacted canine. The present study was conducted to prove and determine that localization is feasible with a single panoramic radiograph. All patients in the study were subjected to panoramic radiography, which was compared with the visual method in cases where erupted malposed canines were seen, and the buccal object rule was used in cases where the maxillary canine was impacted. The correct prediction of the palatal or labial canine position using panoramic localization came to 90%, thus, suggesting that the panoramic radiograph is moderately reliable in localizing the maxillary impacted canine. Liu DG, Zhang WL, Zhang ZY, Wu YT, Ma XC. Localization of impacted maxillary canines and observation of adjacent incisor resorption with cone-beam computed tomography. Oral Surg Oral Med Oral Pathol Oral Radiol Endod 2008;105:91-8. Mason C, Papadakou P, Roberts GJ. The radiographic localization of impacted maxillary canines: A comparison of methods. Eur J Orthod 2001;23:25-34. Nagpal A, Pai KM, Setty S, Sharma G. Localization of impacted maxillary canines using panoramic radiography. J Oral Sci 2009;51:37-45. Chaushu S, Chaushu G, Becker A. The use of panoramic radiographs to localize displaced maxillary canines. Oral Surg Oral Med Oral Pathol Oral Radiol Endod 1999;88:511-6. Gavel V, Dermaut L. The effect of tooth position on the image of unerupted canines on panoramic radiographs. Eur J Orthod 1999;21:551-60. Sudhakar S, Patil K, Mahima VG. Localization of impacted permanent maxillary canine using single panoramic radiograph. Indian J Dent Res 2009;20:340-5. Bedoya MM, Park JH. A review of the diagnosis and management of impacted maxillary canines. J Am Dent Assoc 2009;140:1485-93. Litsas G, Acar A. A review of early displaced maxillary canines: Etiology, diagnosis and interceptive treatment. Open Dent J 2011;5:39-47. Richardson G, Russell KA. A review of impacted permanent maxillary cuspids - diagnosis and prevention. J Can Dent Assoc 2000;66:497-501. Peck S, Peck L, Kataja M. The palatally displaced canine as a dental anomaly of genetic origin. Angle Orthod 1994;64:249-56. Nordenram A, Strömberg C. Positional variations of the impacted upper canine: A clinical and radiologic study. Oral Surg Oral Med Oral Pathol 1966;22:711-4. Bhuvaneshwari S, Ahmed J, Singh MP. Use of panoramic radiograph as a single radiographic technique to localize impacted maxillary canine. J Cancer Sci Ther 2010;2:163-5. Katsnelson A, Flick WG, Susarla S, Tartakovsky JV, Miloro M. Use of panoramic x-ray to determine position of impacted maxillary canines. J Oral Maxillofac Surg 2010;68:996-1000.